Washington, DC’s long anticipated retail development, The Shops at Dakota Crossing, will offer destination retail shopping to the historically underserved District neighborhoods and the adjacent Maryland suburbs. Its strategic location on New York Avenue/Route 50 at South Dakota Avenue in the northeast area of Washington, DC, provides excellent visibility and easy access to an impressive 100,000 vehicles per day. 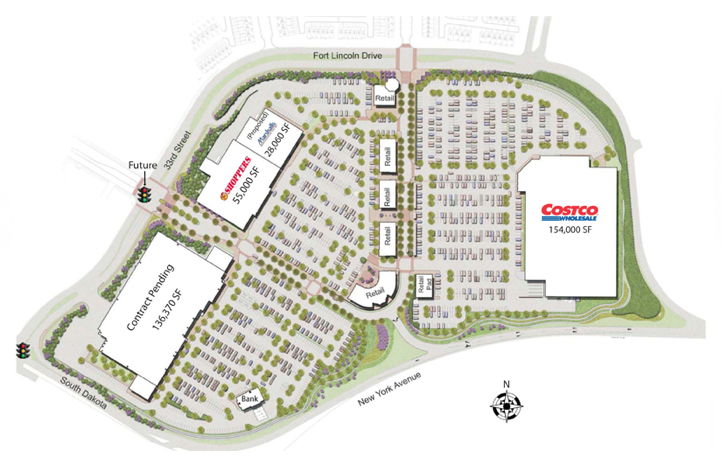 The Shops at Dakota Crossing is known as “The Gateway to Washington.” Retailers will benefit from the enormous regional draw of industry leader Costco, as well as one of the area’s top grocers, Shoppers Food. A strategic mix of national, regional and local retailers and restaurants will be located in the walkable “main street” area of the center with easy access to the adjacent Fort Lincoln neighborhood – one of the most vibrant and successful residential communities in the area. The Shops at Dakota Crossing’s beautifully landscaped open spaces, public plazas and outdoor seating areas, as well as convenient surface parking, create the perfect blend of a highly desirable neighborhood environment with the strong regional draw of the country’s top retailers. We talked about Costco opening back in November. Multiple sources familiar with the deal say Charlotte, N.C.-based Lowe’s Cos. Inc. (NYSE: LOW) will occupy a 130,000-square-foot building at 33rd Street and South Dakota Avenue NE. Target was, until late 2011, slated to occupy 136,000 square feet on the same parcel. But Target backed out, and it has taken some time to find a replacement anchor. Anyone prefer Lowe’s to Home Depot?